Germany train travel tips & questions - This is another contribution to my growing train travel guide. Look around, and you'll certainly find useful answers to your questions. I have already written a few pages to help you get around by public transport. This includes info about the German rail network and trains in Germany, whether or not using rail passes might save you money, the BahnCard while you travel in Germany by train. Perhaps, I am going to write more about trains and public transport. Why? I just think travelling by train, especially long distances, is the best way to travel in my country. I love train travels! Sure, sometimes I swear! Using the S-Bahn every day to commute to work, I am annoyed about every minute the train is late. It is my precious time, after all. However, if you are on holidays, you probably won't be as stressed as the daily commuters, and you won't notice a five minutes delay of your train at all. Getting around in cities and metropolitan areas like Frankfurt, Berlin, Ruhr? Nothing better than using public transport. You would lose more time in daily traffic jams than on any delayed train, believe me. Buses S- and U-Bahnen bring you everywhere, and you don't have to spend a fortune on parking fees. Here's the overview of all rail related topics. Just a few thoughts on planning your train journey. Try to get a direct train if possible. When you have much luggage it is easier if you don't have to change trains. Plus, you avoid missing the connecting train. If you have to change trains, plan for reasonable transfer times, especially if you want to catch a train with a booked seat. Low price tickets for long-distance connections are only valid on the train you booked, so be sure to catch that train. Regular tickets and rail passes are valid on all trains on your travel day, so you only lose your reserved seat when you miss a train. Most train stations in German cities are close to the city centre. When you have an hour before your connecting train leaves, put your baggage into a locker, go for a drink, or have a short look on the surrounding area. Plan reasonably, get in time to the station, and you'll be right. If you run into any problems, there are service points on all major railway stations where you can get help. Buy your train ticket in advance to avoid stress and queues on your travel day. Check out if you find any Train Ticket Offers . Search results on the DB website always show the discounted Sparpreis (if still available) and the regular price. When travelling on local trains, S-Bahnen, U-Bahnen and trams it is essential that you purchase your ticket at a ticket machine on the platform before you board the train. You can purchase tickets in most buses, though. To get from A to B with one ticket you can change trains and from train to bus in order to reach your destination. However, you always have to take the next S-Bahn, tram or bus. A break of the journey is not allowed. For example, if you plan to go from Munich to Neuschwanstein Castle by public transport, you buy a ticket to Hohenschwangau. It is valid for the train to Füssen and the bus to Hohenschwangau. Interruptions are not allowed, you can't stay in Füssen for a few hours and continue with the same ticket. When you want to explore a city by public transport, buy a day ticket or purchase a ticket for the hop-on hop-off tours in major cities. Having some experience with train travel in Germany, I am sure I can answer your general questions. Please understand, I can't give you individual schedules and prices, I am not a travel agent. However, I have partnered with the Deutsche Bahn, RailEurope and ACP Rail to offer you the possibility to get more information about timetables, tickets and rail passes. Find the relevant links in the grey box above right. Okay, here a a few frequently asked questions answered. 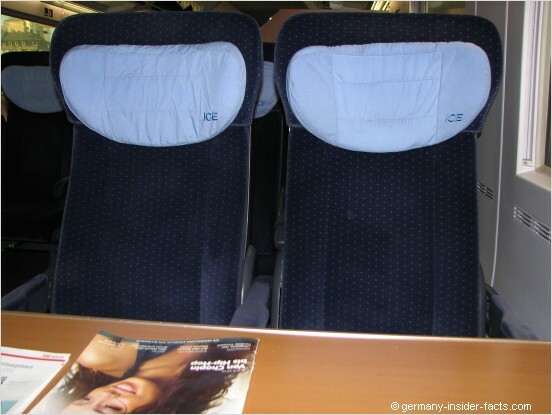 Are euro rail passes valid on ICE trains? - Yes, they are valid, and there is no surcharge. You only have to pay extra for a seat reservation. Eurail passes for local trams and busses? - No. In some cities a rail pass is valid on the S-Bahn if it is operated by the Deutsche Bahn. But there could be restrictions. Is the German Rail Pass only valid in Germany? - Yes, with the exception that you can travel from Germany to Salzburg, Austria and to Basel, Switzerland. Don't think it is too complicated to travel by train, it isn't. Train travel is fun, and the most relaxed way to discover Germany. Below is a list of questions (and answers) readers have already asked. I am pretty sure you will find many useful tips there. You can add a comment to any topic.